I've recently built a nice 12' long kitchen island, using some figured Bubinga veneer which had apparently been treated with some kind of salt, i suppose, which is drawing moisture out of the atmosphere on very humid days. It is enough to look and feel wet. I plan to build a tent, using a tarp, then place a heater in there to dry it before finishing. But I'm wondering if anyone has experience using treated wood that could recommend what type of sealer to use, or not use? I am going to assume someone used Flamort fire retardant on your island? You say fire retardant in the title and salt in the body of the text. Since it is a residential environment it doesn't have to meet class A fire suppression so I would just try and sand off as much of it as you can and providing you are able to spray I would use a 2K isolante coating or a catalyzed vinyl as a sealer and then a 2K polyurethane coating in whatever sheen and build you are after. Thanks for the suggestion Rick. the veneer was some left over from a corporate jet interior. I guess it may be required or at least a good idea to not use flammable materials at 30,000' where you can't count on getting a fire truck anytime soon. As for sanding it off, I think it is permeated throughout. I'll do a search for Flamort fire retardant, to see if I can learn anything. Again thanks for the suggestion. Bubinga also is notorious for having varied size pores, so either a completely open pore finish or a completely closed pore finish works better than anything in-between. I attached the TDS for Flamort 6-3. 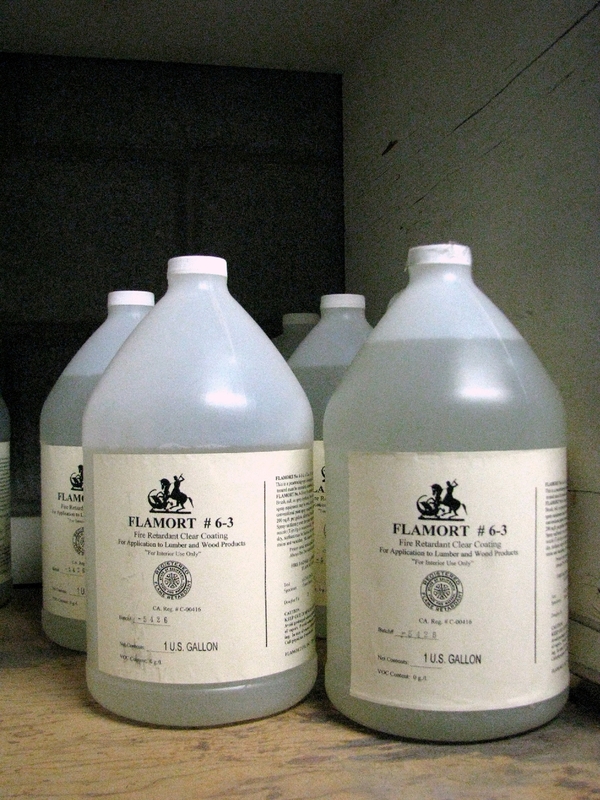 Flamort has a number of retardant products and this is the one that's used on bare wood. It's a topical treatment and can be sanded off pretty easily though it sounds like it was applied heavily. I'd wash it off with fresh water, let it dry, and sand lightly to smooth before top coating. Test everything on a scrap if you can. I usually use conversion varnish (CV) over it - 1 coat sealer and 1-2 top coats but 2K PU is also a good choice.